Ghada Abdel Khalek has been in the hotel industry since 1988. Driven by challenge, success, and a desire to learn, her journey started at the Movenpick, then she moved to the Cairo Marriott as Public Relations and Promotions Manager, and later became the Area Public Relations and Promotions Manager at the Conrad hotel. A shift took place in her career in 2001 when she went to work for the Special Olympics regional office in the Middle East and Africa for eight years. After this break, Abdel Khalek went back to the Cairo Marriott where she realized she felt most at home. Abdel Khalek tells eniGma’s Salma Hussein about her journey. 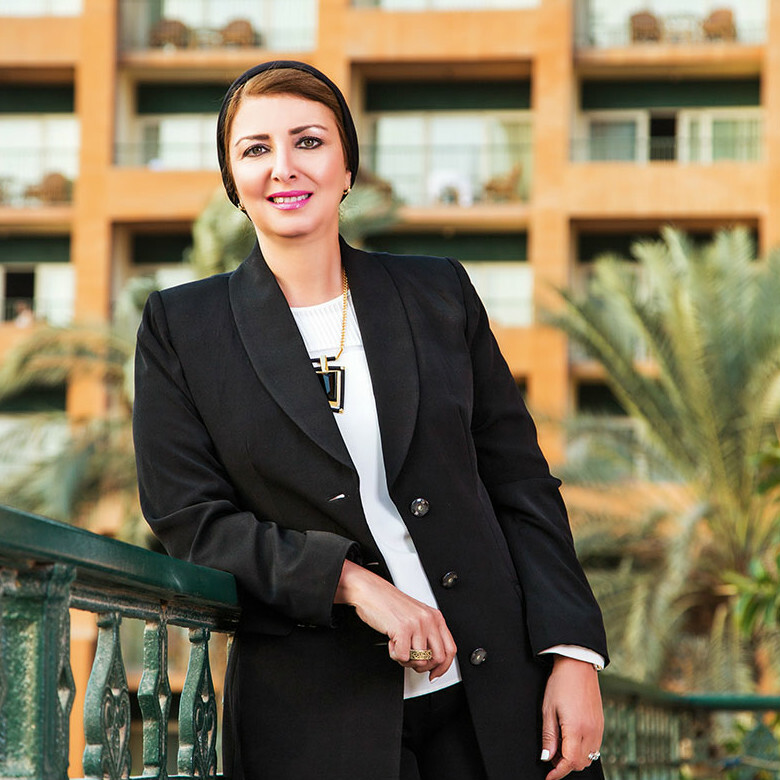 When Abdel Khalek went back to the Cairo Marriott in 2010 as the Director of Marketing Communications, she was quite astonished at the changes in the industry and the tourism market. “Back in 1988, the term marketing communications didn’t exist, the market has gone crazy about marketing and innovations, about communication itself; the channels and tools are completely different,” she exclaims. Being in charge of ecommerce now, Abdel Khalek had to learn about it all; otherwise she would have been completely in the dark. Customers’ needs had changed and meeting them required making an effort and striving to keep up with new technologies and innovations. According to Abdel Khalek, there are now various startups in the industry that offer what the Cairo Marriott was known for. That is why it is essential to pay attention to the changes in the market, to go above and beyond what is being offered, and to address areas that other hotels do not address. She adds that the changes have caused things to happen at a higher speed. This means that “if you are not up to the speed of change, you will lose. In a world that is changing day by day, it is imperative to stay up-to-date and to speak the same marketing language as everyone else,” she explains. She adds that, at the Cairo Marriott, they had to maintain a balance that involved marketing to their target audience, which includes all age groups, while also aiming not to lose their identity and how they are perceived by others. According to Abdel Khalek, Egypt needs to be a country that speaks tourism all the time. She points out that foreigners do not just interact with those in the hotel industry, but with the country as a whole, even including the guard at the airport gate. There needs to be a general mood that welcomes tourists. The hospitality industry is just one factor in the Egyptian tourism industry. Abdel Khalek believes that, even though Egypt has a beautiful product and Egyptians are welcoming by nature, “we lack consistency; when we do something right the first time, we don’t necessarily keep doing it right every time,” she explains. “We need to adapt to change and think differently in order to respond to clients’ needs. The majority of guests coming to Egypt are younger now, which requires us to adapt and offer new services. For example we offer mobile applications to check in before the guest physically arrives to the hotel, or to order room or laundry service while still at the airport. These new technologies are appealing to the young, and we need to be up to all of this. Not only the hotel industry, but the whole country has to speak one language welcoming tourism,” she explains. Having gone through the various times when tourism suffered over the years, including the Luxor incident, the Gulf War, and the Egyptian Revolution, Abdel Khalek believes that the current crisis will hopefully pass. She believes that it is essential to look for new markets to find substitutes for the ones that were lost. Addressing internal issues is also important. Abdel Khalek notes that the use of social media at the Cairo Marriott is very important, which is why they aim to create many activites around it. The Cairo Marriott launched a campaign, #ACTV8EGYPT, aiming to bring back tourism to Egypt. Marriott International believes in Egypt, Abdel Khalek exclaims, adding that “this too shall pass,” and that the world of tourism will come back to Egypt. Motivated by challenge, wanting to be a trend setter and positioned in a good place, Abdel Khalek claims that her career always causes her to be on the edge. Working at the Cairo Marriott has caused her to challenge herself in various ways, while always trying to maintain a balance between her work and her role as a mother and wife. “It’s challenging to be successful at work and a successful wife and mother,” says Abdel Khalek. She believes that in order to succeed, one needs to work hard, be different, seek opportunities, and get involved in fields that are new. Her personal experience has taught her that you have to love what you do and do it passionately. This is reflected in the way you talk and deal with things.